We’ve all been there. As children, we left it up to flower petals to determine if our crush liked us back. Simpler times, am I right? But as marketers, we know that our subscribers’ emotions aren’t so black and white. We’re challenged with engaging thousands, hundreds of thousands, and sometimes even millions of subscribers in a way that makes them love us and want to buy our products or services. Unfortunately, you can’t please everyone. In every email database, there’s a portion of subscribers who you might refer to as the “love me nots.” These inactive subscribers haven’t engaged with your emails in a very long time, which could be because their interests or jobs changed, they received too many emails, or they’re just too busy to respond. Either way, they’ve stopped engaging with your emails and that makes your heart hurt. LOVEFiLM.com really hits you with the feels in their reactivation email. First off, who doesn’t love Antonio Banderas as Puss in Boots? I’m moved to tears. 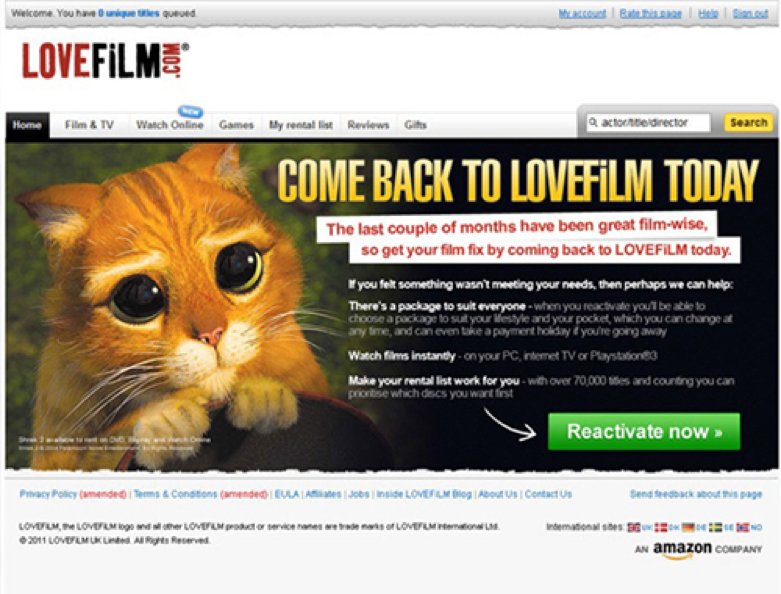 The headline “COME BACK TO LOVEFiLM TODAY” is short, simple, and clear. I know immediately that I haven’t engaged with them in a while and they want me back. Who knew I was so valuable to them? On top of that, they use directional cues to bring my eyes to the big “Reactivate now” button. And quite honestly, those big eyes are just begging me to hit the button. But if that wasn’t enough, they’ve listed different benefits of being a subscriber. 2. Crocs: It’s Been a While! You’ll notice a reoccurring theme in reactivation emails. Most of them tend to use dating language. Language like “It’s been a while,” “Come back to us,” and “We miss you” stands out to inactive subscribers because it’s drastically different from a brand’s standard messaging. 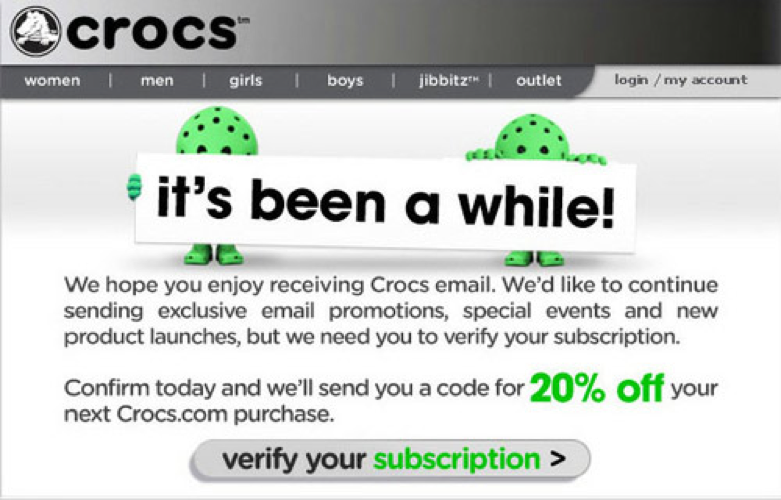 Here, Crocs tells you it’s been a while since you’ve engaged, explains the value of their emails, and then entices a new purchase with a 20% off discount code in exchange for verifying the email subscription. I’m feeling the love, Crocs! I’d come back to you any day! Oh boy, here we go again with the cute animals. 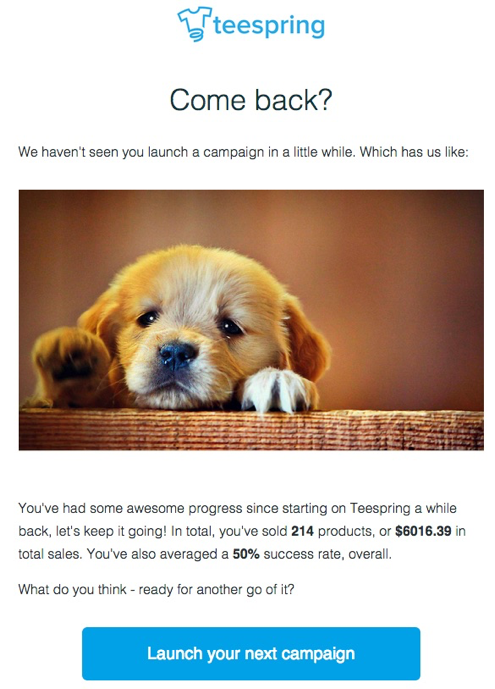 Teespring really nailed it with their reactivation email. First off, show me a cute puppy and you have my undivided attention. While this might seem silly, it’s actually the perfect strategy for captivating your inactive subscribers. Show them something they can’t look away from, and you’ll get more inactive subscribers to engage. The headline “Come Back?” is simple yet actionable. The copy is lighthearted and leverages powerful personalization to prove the impact of their product for each individual subscriber. Well done, teespring! 4. Chipotle: Should You Stay or Should You Go? No puppies here, but would you look at that headline! Should I stay or should I go? What do you mean, Chipotle? Beneath the headline, the email reads “At some point you either signed up on our promotions list or you’ve been a customer of our Online Ordering, or both.” Immediately, I have context for why they are emailing me. This doesn’t feel unsolicited. 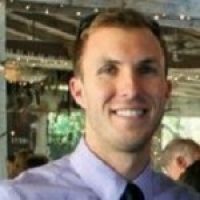 Chiptotle explains,“We’re cleaning up our list and want to be certain as to whether or not you still want to be on it.” As an email marketer, list hygiene is critically important to your database health. 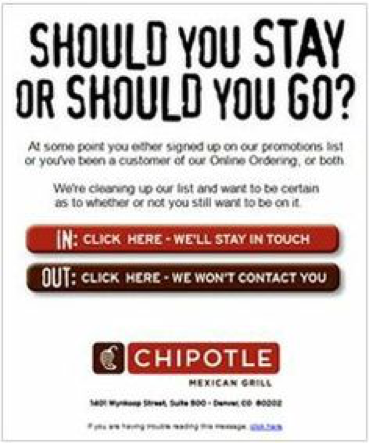 Chipotle sets a great example, creating context and then prompting the subscriber to decide what happens next. 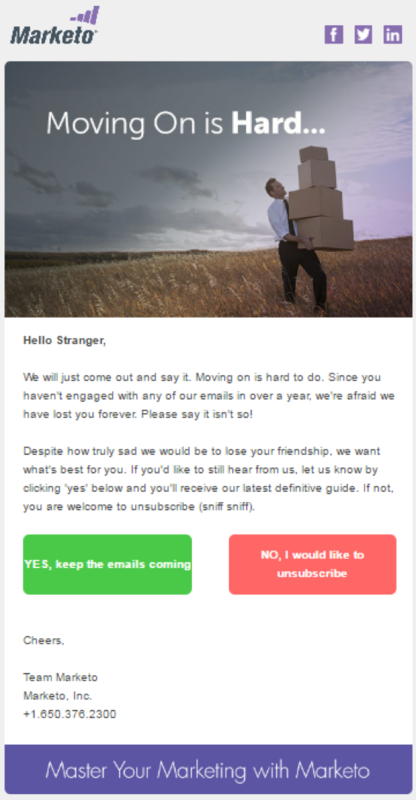 Those who want to stay in touch will continue to engage, and those who click to opt-out get unsubscribed—which means Chipotle doesn’t send irrelevant emails anymore and the subscriber parts ways without marking Chipotle as spam, ultimately improving email deliverability. Overall, this email is extremely effective for maintaining a healthy database, re-engaging inactive subscribers, and identifying subscribers who want to opt-out. Lastly, here’s an example from our reactivation nurture program. Similar to the emails above, we write our emails in a light-hearted, fun tone. We tell our subscribers how it’s breaking our hearts that they haven’t engaged with Marketo emails in over a year. Then, we give them a clear Yes/No option using directional colors (green for go and red for stop) to illicit a response. We’ve found that by making it convenient for subscribers to take action, they were more likely to say “Yes” and remain opted in. It’s important here to note that when you’re trying to recover the “love me nots,” be sure to call out a link to your unsubscribe page or preference center. The last thing you want to do is upset folks, which might urge them to mark you as spam. And that’s it! I can’t wait to see you at my session at The Marketing Nation Summit, but until then what are your favorite examples of reactivation campaigns? Do you use them yourself? I’d love to hear in the comments below.